The City College cafeteria shows a variety of healthy options. Photo by Guinevere Yep. With the national rise in obesity, many people, including college students, have become concerned about what they eat. For many, it can be inconvenient to bring their food or leave campus to eat. Because of time constraints or lack of transportation, often times, this leaves one option: the City Cafe. 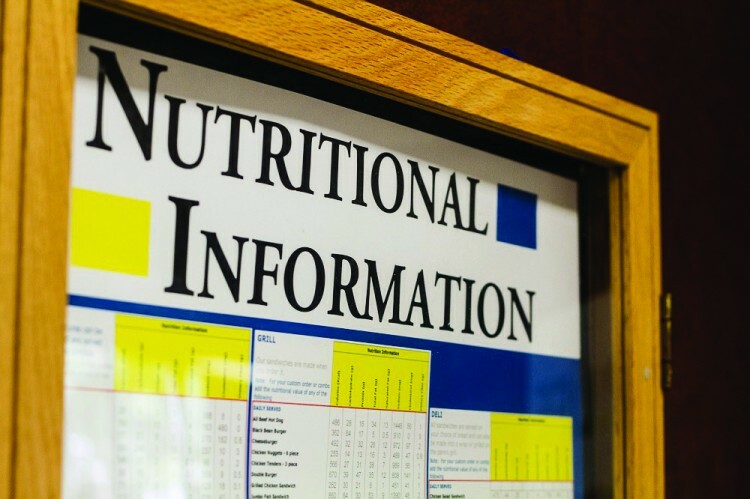 But how healthy is the food on campus, what steps are the college taking to ensure healthy options for those who want them and who decides what food is served? Aramark representatives stressed that on-campus food options are mostly based on sales. “When we choose what foods are going to be distributed out to the students, we will look at basically what sells and what does not sell,” says Frank Gleason, senior food service director for Aramark, the vendor that provides food served on campus. Still, Gleason says there are healthy snacks offered, and some sell quite well. “Some campus favorites are the everyday burger, which is less expensive, and the chicken patty burger, which is a healthier item on the menu,” says Gleason. City College nurse Wendy Gomez is a part of the campus Food Advisory Group, which makes sure that prices are reasonable and, she says, also helps choose what foods go in to the cafeteria. For students, their food preferences come down to variety, but healthy choices are a concern, too. City College student Lauren Smith, nursing major, says she only eats in the cafeteria Tuesdays and Thursdays, and she gets coffee in the mornings. Donald Williams, human services major, said he eats breakfast in the City Cafe Tuesdays and Thursdays, but doesn’t worry too much about making healthy choices. Williams added that he thinks his breakfast choices are pretty average and pointed out that the cafeteria does offer healthy alternatives. Jason Wong, social studies major, says he eats lunch at the City Cafe every day. Other students avoid the cafeteria altogether. Robert Curry, office administration major, says he seldom eats campus food, but not because of health concerns. “I am on a tight budget, unemployed and receiving financial aid,” says Curry. Though Curry’s reasoning for not eating cafeteria food may not be about health, he explained that he does think about his food choices. Curry also speculated about possible reasons why the college doesn’t offer more health-conscious goodies. “Schools operate on a budget and, depending on how the budget goes, they are able to bring in more healthy foods or just keep what they got because healthy foods tend to be more expensive,” says Curry. Written in collaboration with Edwin Booze. Additional reporting by Priya McCluskey. This entry was posted in Features, Sac City Express (SCC) and tagged aramark, cafe, cafeteria, City Cafe, City College, daniel wilson, edwin booze, food, healthy choices, nutrition, priya mccluskey, Robert Curry, Sac City College, SCC. Bookmark the permalink.